Obtaining a SIM is fairly straightforward in India, thanks largely to Aadhaar (Unique ID linked to people’s biometrics) that nearly every Indian has now. All a citizen needs to do is to provide their Aadhaar number and biometrics (fingerprint of iris) and the KYC is done electronically. Instantly. While this seems like a perfect solution, several technologies have to come together for a single authentication (e.g. UIDAI servers, Authentication user agencies that securely access the central biometric data store, Customer’s servers/software that connects to user agencies, Registered biometric devices and most of all the person’s fingerprint). The potential for failure is highly probable in areas with patchy connectivity or worn out fingerprints. And even a small percentage failure has a large impact in a country with over a billion people. To tackle this and to provide better inclusion, UIDAI announced the addition of face verification in fusion mode in January 2018 (note that face cannot be used on its own for authentication, however it can be used alongside fingerprint or iris so there is greater chance of a successful authentication). While the rollout date has been pushed by a few months, UIDAI has now set a date of 15 September 2018 for a phased rollout of Face Authentication starting with Telcos. And for good reasons, as a SIM is perhaps the gateway to a variety of financial services and the associated identity fraud and subscription fraud are very real in India. And protecting them from vicious fraud and identity theft can only be a good thing for citizens. “Combination of live face with fingerprint in authentication will also enhance Aadhaar security as it will effectively curb fingerprint spoofing” – Mr. Pandey – CEO, UIDAI. While the modalities of face capture, security and authentication is provided by UIDAI through registered devices (i.e. hardware providers that allows capture of biometrics and face), UIDAI has placed the onus of matching the live face against the face returned from UDIAI (as part of the electronic KYC) with the Telcos before they activate the SIM. 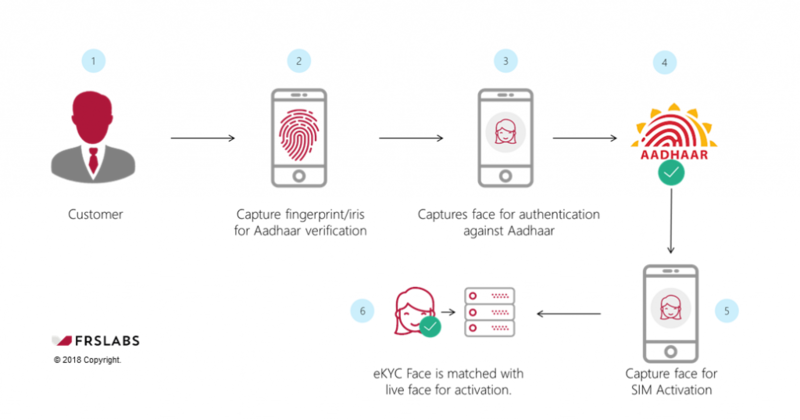 One reason why the face capture needs to be done a second time is that the eKYC authentication is done at the UIDAI servers and the biometric details (including face) are not allowed to be stored by the Telcos. There is a real need for Telcos to be compliant but more importantly this is a great step toward reducing identity fraud and bringing the goal of inclusion even closer. Our Atlas KYC solution is a perfect fit to accomplish this for Telcos. Once the eKYC is done, the customer face is captured (with liveness detection) and matched against the photo received from UIDAI – all in the customer’s servers in full compliance and audit trail as mandated by UIDAI. To learn more about this groundbreaking technology, please drop us a mail to info@frslabs.com.